The men with those two hats. If you agree with me that house/electronic music is the best music in the world, then we would need to owe a pile-high mountain sized amount of respect and gratitude to the most genre defining production team in dance music history: Masters at Work. This week, Defected Records launched another volume of their House Masters line of CD releases, but this one, sort of blows all the others straight outta dodge. To say, this town [NYC] is not big enough for the both of us, would be an understatement, so you would have to move over to the side, fellow “House Masters”, and engage in the listening experience and spectacle of nearly three decades of work, laid out amongst 4 CDs titled House Masters Masters At Work. Who are Masters at Work? 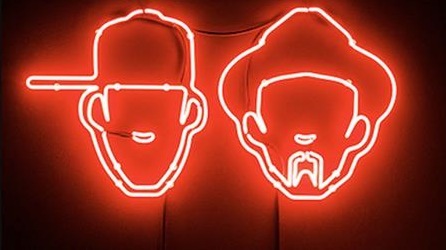 Masters At Work is the spawning of Little Louie Vega and Kenny “Dope” Gonzalez. Their story is quite interesting because Louie was essentially your regular metro area superstar DJ in a time way before the EDM idiocracy and the over the top international bookings, and Kenny was your around the way street DJ, carrying crates and patching in to power sources while watching his back for police cruisers and hoods. Louie had a broad understanding of layout and texture found in a cut, but like most success stories that just doesn’t cut it for the absurdity of brilliance in the pounding of beats on the dance floor, so enters Kenny, a master of chaotic beats and loops on the pricey cubed electronic mechanisms that created house music. After being introduced to eachother by legenday sampling madman Todd Terry and countless studio sessions and remix bookings, what you have is the the product of Masters At Work aka MAW, which made them a worldwide success, grasped by the appreciation from varying forms of clubsters from rave heads to hip-hoppers. And even though House music came over from Chicago, it was MAW, that added the NYC touch of greatness. These two men are the true NYC legends of dance music. To get a good footing, I found this amazing 2+ hour Red Bull Academy tribute to MAW. Enjoy it ! Lecture: Masters At Work (New York, 2013) from Red Bull Music Academy on Vimeo.